60fps, 30fps - or somewhere in-between. You decide. The last two months have been remarkable for fans of Japanese games and with the release of Nioh for PlayStation 4, the trinity of highly anticipated, long in-development games is now complete. We're, of course, talking about Final Fantasy 15 and The Last Guardian - two games that, along with Nioh, were first announced more than a decade ago. 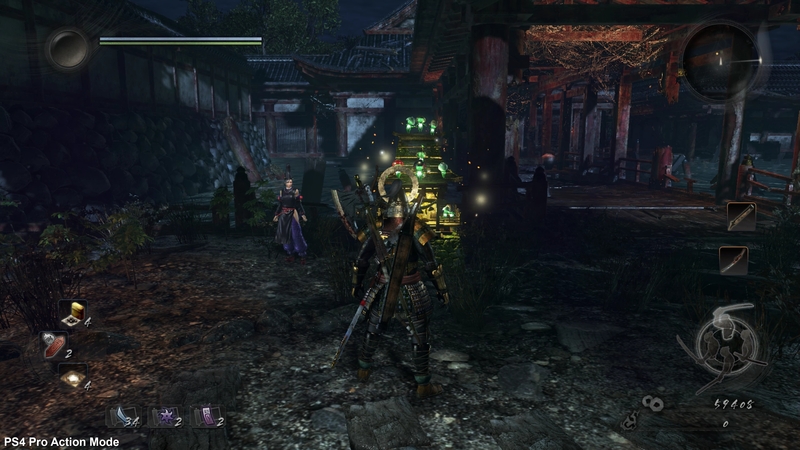 All three games have undergone a significant transformation since then but perhaps none more than Nioh. What we have in the end is a dark, brutally difficult action game that combines the best elements of Ninja Gaiden and Dark Souls into one remarkable package. This is, simply put, Team Ninja's return to form. 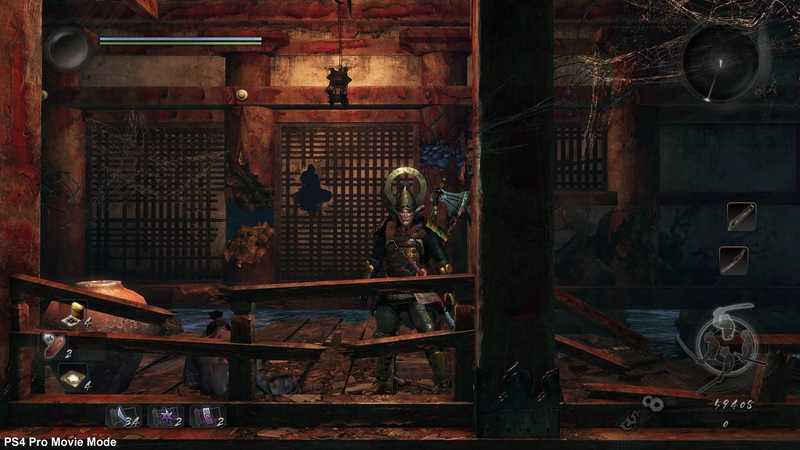 At first glance, Nioh is a visually conservative game - one that pushes modern post-processing effects and cutting-edge rendering techniques off to the side in favour of a more reserved presentation. It won't leave your jaw on the floor by any means, but over time, it leaves a strong impression. In many ways, it feels like an evolution of what Team Ninja started with the 2004 iteration of Ninja Gaiden - sharp, clean lines and detailed texture work combine with fast, fluid animation to great effect. 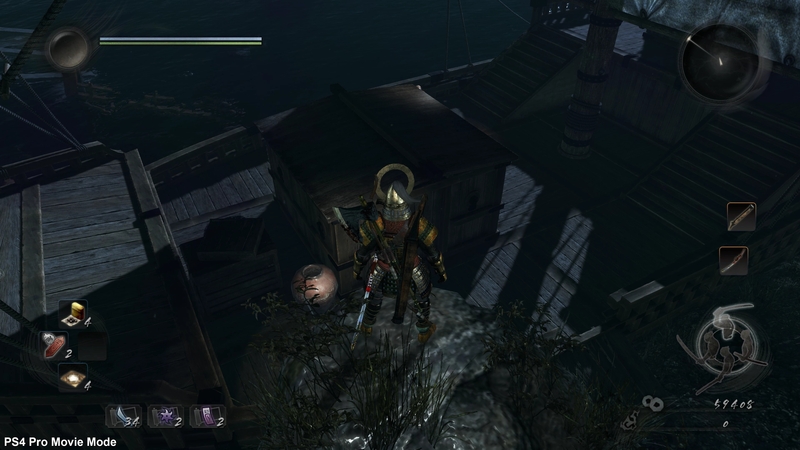 Rather than relying on features such as parallax occlusion mapping, for instance, Nioh instead adds surface detail through sheer geometric density taking a page from Dark Souls 3 and Bloodborne, in a sense. Large, rocky surfaces undulate convincingly while fully modeled tiles make up the ground on which you walk. 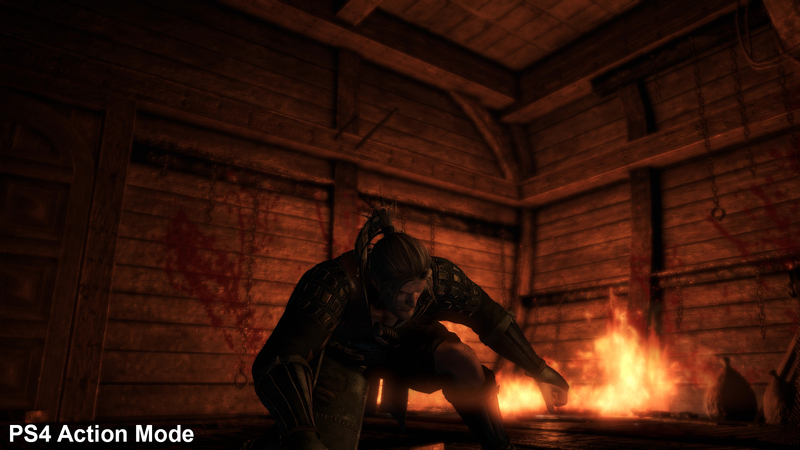 Nioh simply oozes with atmosphere thanks to stylised lighting and weather effects. 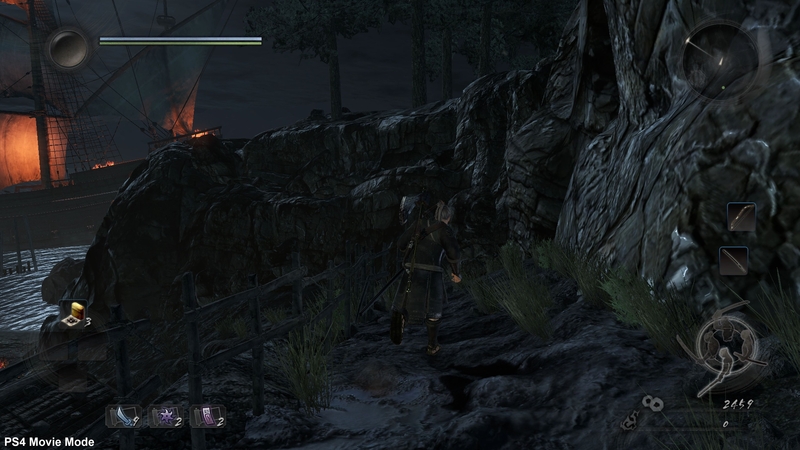 The rain-swept village encountered early on fills the screen with droplets which, using a screen-space technique, take on light from surrounding torches and attacks. Texture work is solid with plenty of detail slathered across each scene while specular highlights allow for dynamic lighting to play nicely off the detailed terrain. 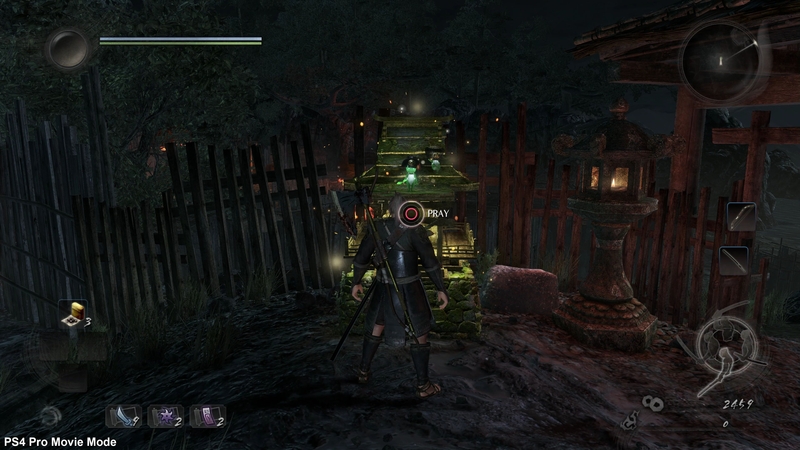 Character models feel like an evolution of what we've come to know from Team Ninja with rounded edges and clean lines. You'll run across a handful of low resolution assets here and there but the overall appearance is solid. 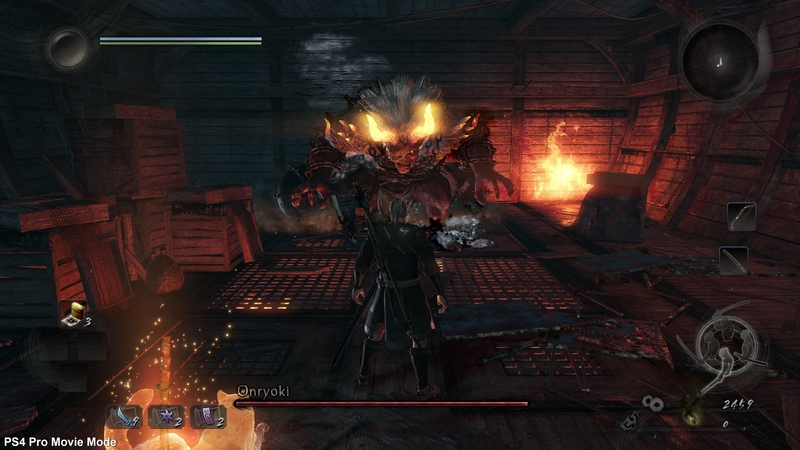 Team Ninja games have traditionally focused on sleek, polished visuals, a fast frame-rate and fluid animation but Nioh takes things further by offering players a selection of options to tailor your experience. 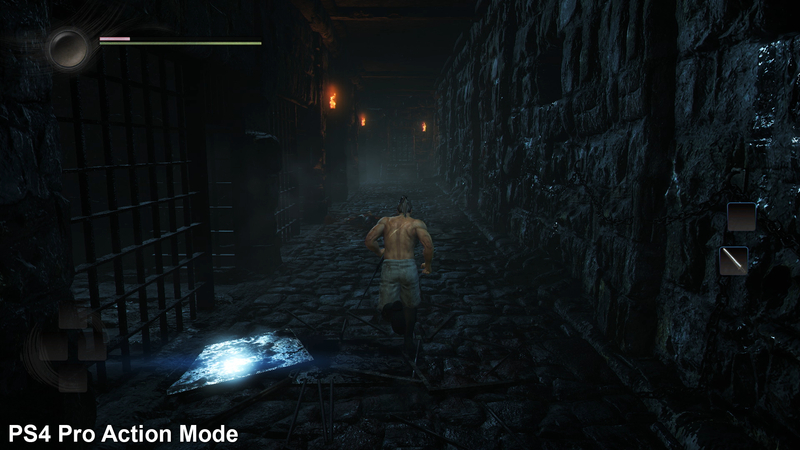 There are three gameplay modes available here - action mode, movie mode and a variable movie mode. 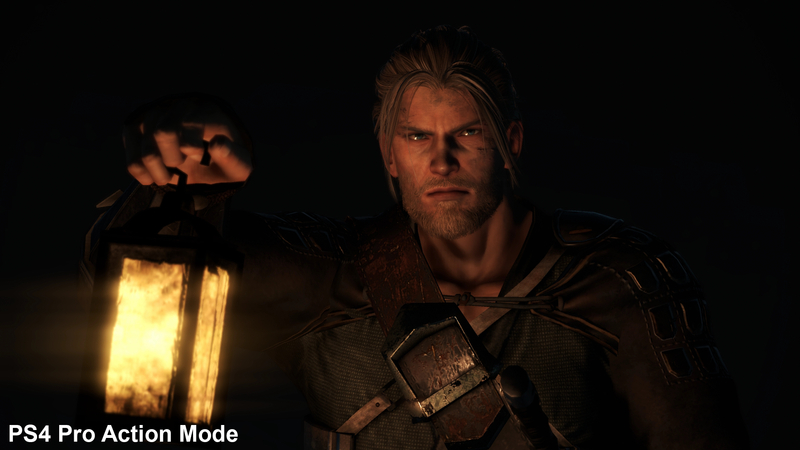 Action mode focuses on delivering 60 frames per second at the expense of image quality, movie mode is instead capped at 30fps with a priority on resolution while variable mode tries to find a middle ground. All three options are available on both PS4 and the PS4 Pro. Our video analysis of Nioh showcases the differences between the PS4 and PS4 Pro across all three modes. On the PS4 Pro, adaptive resolution feature plays a significant role then. After pixel counting a huge number of shots, we came across a wide resolution variation in each mode. While using the action mode, Nioh presents resolutions including a full 1080p, 1728x972, 1665x940, 1472x828 and even 1280x720 in rare instances. In comparison, the movie mode sees a variation in resolution ranging from 2160p to 1800p down to 1440p. The variable movie mode even exhibits drops to 2304x1296 at points. This option also enables slightly higher resolution shadow maps, while the increased pixel count helps enhance texture filtering. The same technique is used on the standard PlayStation 4 console as well. 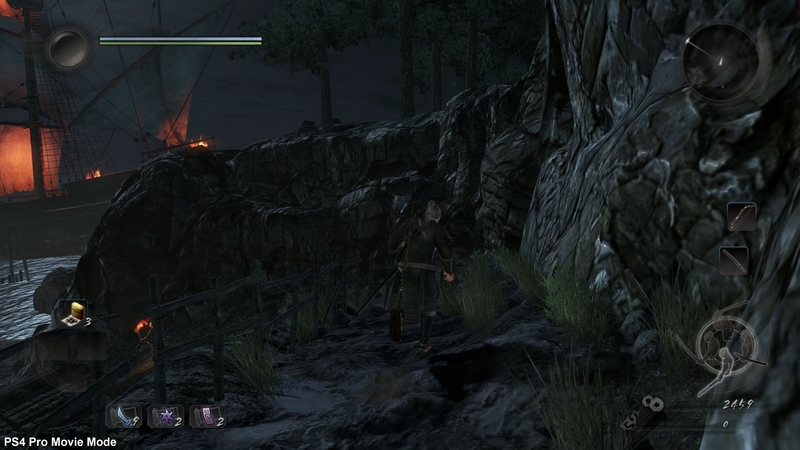 When using the action mode, Nioh spends a lot of time at 720p mark but regularly jumps up to higher resolutions, such as 1600x900 or 1728x972. You can expect these higher resolutions when pointing the camera towards less complex scenery but on average, image quality is visibly less refined on the base system. For those demanding improved image quality, movie mode bumps the game up to 1080p at 30 frames per second. We still spotted the odd drop in image quality now and then but it's 99 per cent locked at 1080p using this option. With so many different modes available, the big question is one of performance. 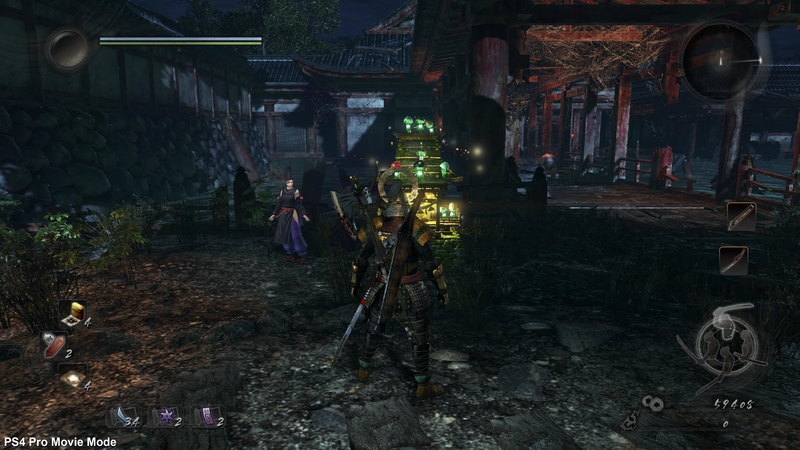 To start with, Nioh defaults to the action mode preset on both systems. Team Ninja games have a rich history of focusing on 60fps: from Dead or Alive to Ninja Gaiden and even Metroid Other M, its games are all about that high frame-rate and Nioh is no exception. As one would hope, the action mode hits and maintains this target frame-rate almost all of the time while providing reasonable image quality. As a result, we feel that action mode on the PS4 Pro is the best way to experience Nioh. 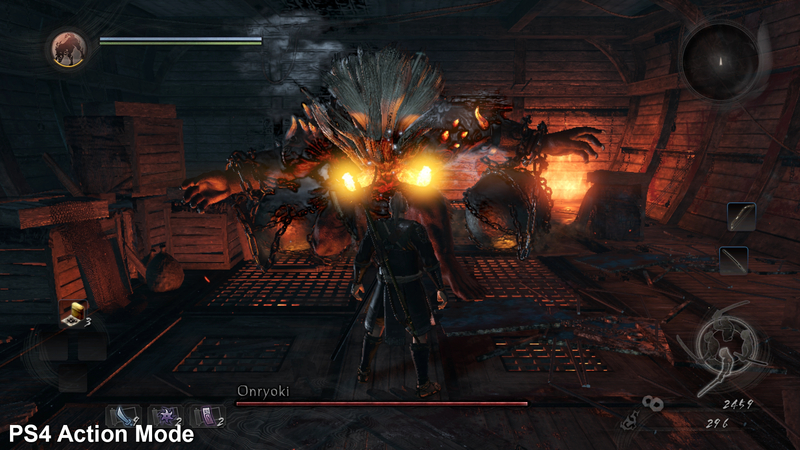 Even in close quarters, large enemy encounters such as this can send the resolution plummeting on the base PlayStation 4. Even basic hallways can exhibit a lot of detail but, once again, we see the PS4 drop down to 720p in order to maintain its frame-rate. 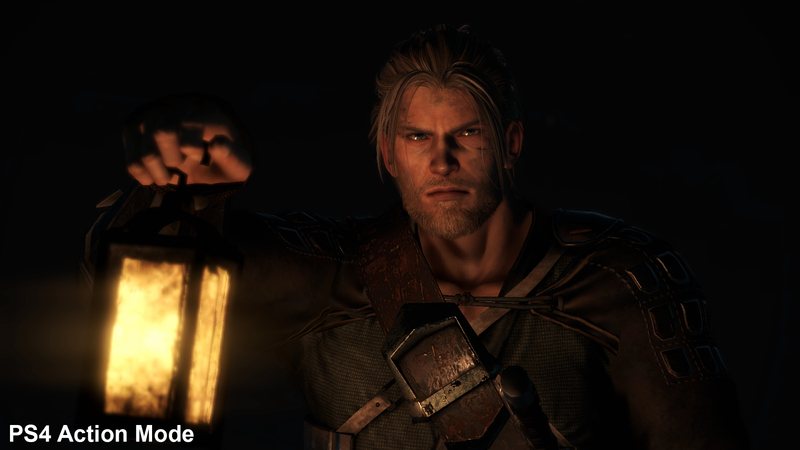 Cutscenes are capped at 30fps so even when using action mode, PS4 Pro owners benefit from a higher resolution or downsampling. The bump in image quality has an impact on the resolution of some effects such as the light depth of field in this shot. Movie mode focuses on image quality over performance. 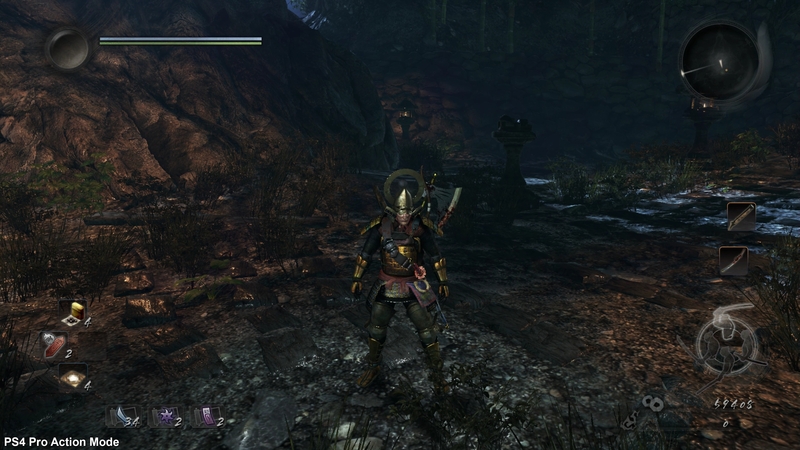 The resolution is greatly increased, as mentioned earlier, and the frame-rate is capped at 30fps. It's true that image quality is indeed improved here but the selected post-process anti-aliasing ultimately means that in-surface aliasing and shimmer remain an issue. 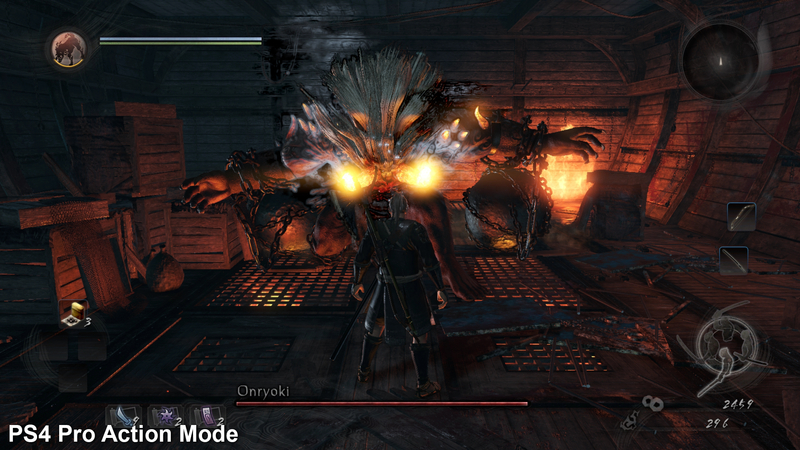 Unfortunately, the fluidity of the experience suffers greatly in this mode for a couple of reasons. Our frame-rate analysis tools suggest only minor dips below 30fps in busy scenes, which is already a disappointment coming from the stable 60fps mode, but the real issue lies in the judder that manifests in this mode. Although frame-pacing is correct and the average frame-rate generally holds stable, there is an inherent stutter present in this mode that results in a jerky overall experience. It's an issue we ran across in Dishonored 2 and the original Windows Store version of Quantum Break. It's as if the camera is traveling four pixels one frame, eight pixels the next and then four pixels after that. It simply doesn't feel right and it's something that remains invisible when using frame-rate analysis tools. We found it incredibly distracting but your mileage may vary. The variable movie mode suffers from this issue to an even greater degree with both an unstable frame-rate and lots of visible judder. In theory, we appreciate the inclusion of an uncapped, high-resolution mode but it just doesn't feel very good to play in this mode. Still, it's great that Team Ninja has opted to cater to different preferences here and we would love to see options such as this in future console releases. Movie mode benefits greatly from an increased pixel count which helps better define thin objects such as foliage. The increase in resolution also improves texture filtering and allows for slightly enhanced shadow maps at a distance. 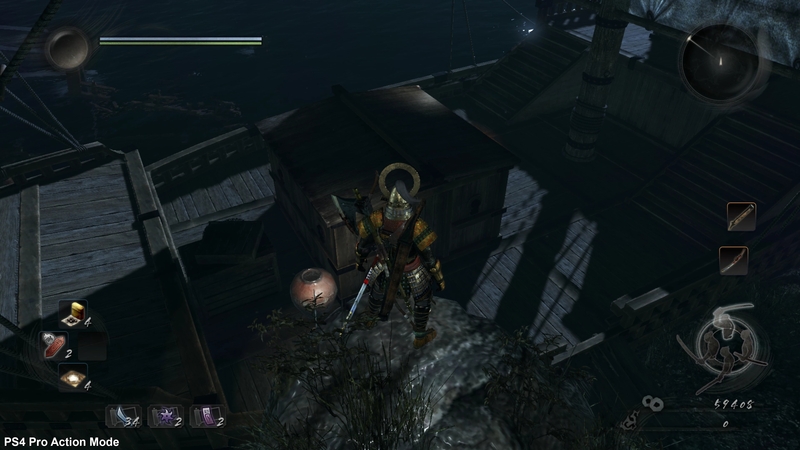 These railings were made for pixel counting but also demonstrate a lack of high quality anti-aliasing in Nioh. 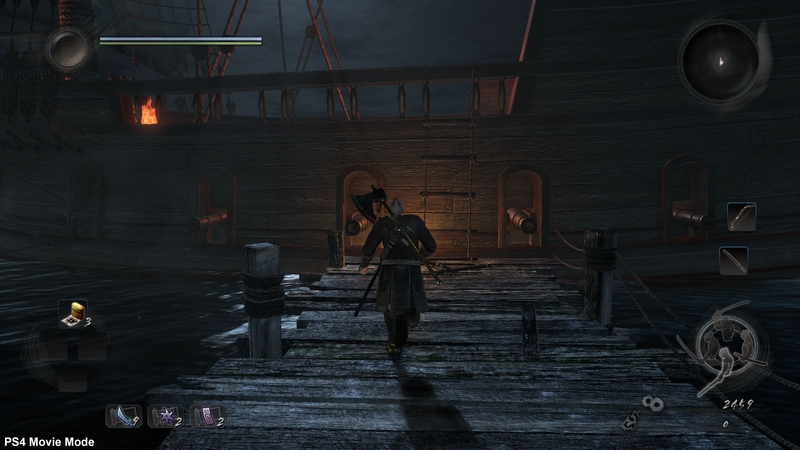 Look closely at the shadows here on the deck of this ruined ship - the resolution is clearly improved in movie mode. What of the standard PlayStation 4 then? After all, this is likely how the majority of Nioh players will experience the game. Thankfully, in action mode, we see a level of performance very close to that of the PS4 Pro. A few additional dropped frames crop up in like-for-like scenarios but by and large, it feels like a steady 60fps. The sacrifice here stems from the lower average resolution which often hangs at 720p. Movie mode suffers from the judder issues that we encountered on the Pro but appears to stick to its 1080p resolution target. Even with its issues, we can only re-iterate that it's great to give users options like this. The game defaults to action mode, which we believe makes for a better playing game, but those that prefer sacrificing performance for image quality are taken care of here. Crucially, owners of both PS4 or PS4 Pro alike both have access to a stable 60fps mode and while it may be surprising to see a PS4 Pro title dropping below 1080p at points, we feel that maintaining a stable frame-rate is most important here. There is one rather curious optimisation trick included in Nioh that is worth mentioning as well - animation quality reduction in large crowds. Like Halo 5, when the battlefield becomes overly crowded, distant enemies no longer make use of animation interpolation resulting in jerky animation that sticks out like a sore thumb. 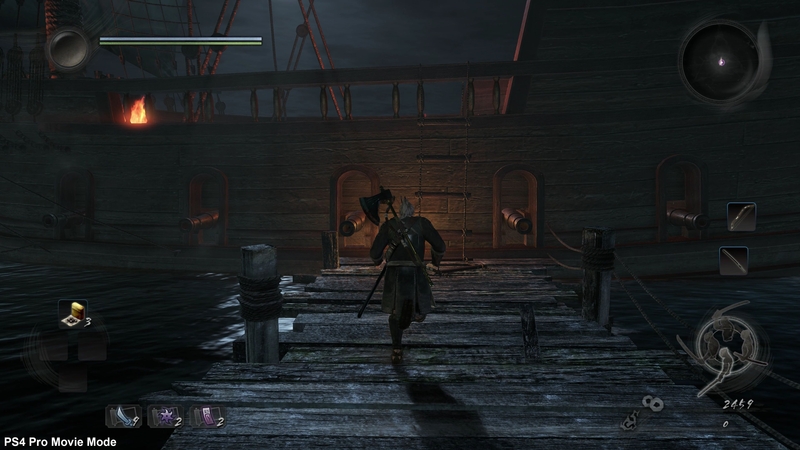 Fortunately, unlike Halo 5, this isn't a common scenario in Nioh and we only ran across this issue when attempting to drop the frame-rate by lining up an array of foes around an entire stage. Here we see movie mode on both PS4 and the Pro. The increased resolution is immediately evident here and looks much crisper. Even at the highest possible resolution, the texture work can sometimes appear somewhat blurry though distant objects are much sharper on PS4 Pro. One of the more subtle differences is seen in the singular flame aboard the ship - the glow is much stronger on the PS4 Pro - perhaps the resolution has an impact on how the effect is rendered? William's character model benefits greatly from the increased resolution but we still feel that action mode is the best way to enjoy Nioh. Another aspect that is important to the Nioh experience are the loading times. 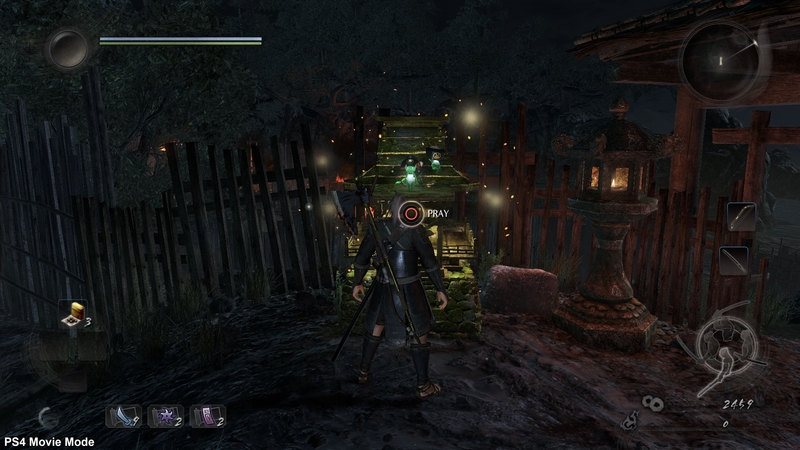 You will lose your life often in Nioh but the time between dying and revival at the nearest shrine is ridiculously short for a game like this. 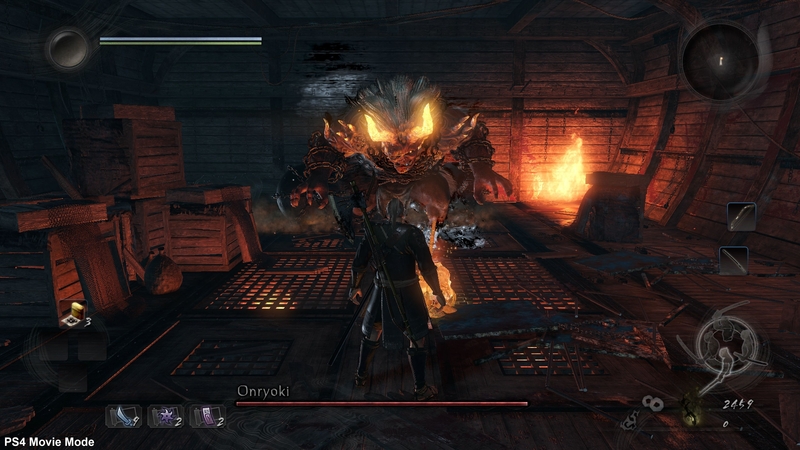 Games such as Bloodborne and Dark Souls III could take upwards of 30 to 60 seconds but Nioh gets the job done in less than five seconds. The speed of loading helps keep you engaged in the action and willing to retry repeatedly. 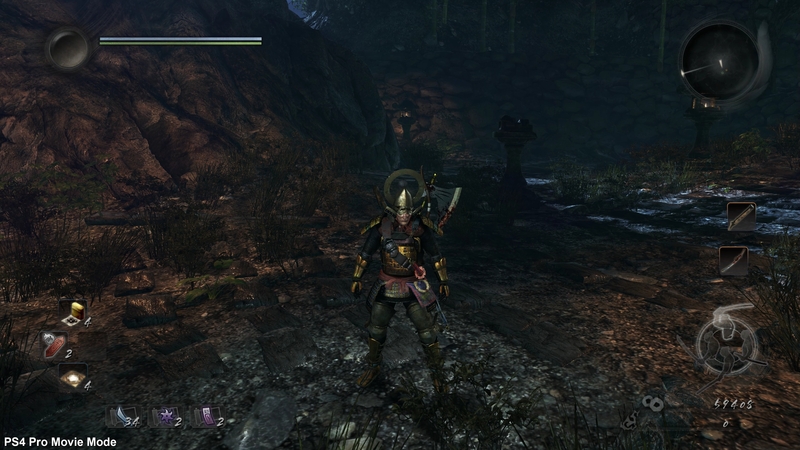 Ultimately, Nioh is a beautifully crafted game all around. All those alpha tests, where the developer listened to user feedback, have paid off in a big way and the end result is a very well-made game. The frame-rate is consistently higher than any of the previous alpha and beta tests while the PS4 Pro implementation is excellent as well. When you couple this with the rapid loading times and the wealth of rendering options, we can only muster praise for Team Ninja's excellent work on this project. Of course, if the developer is continuing to listen to user feedback, we would absolutely love to see movie mode improved to eliminate the persistent judder issues. Aside from this, it's difficult to find much to complain about. It really is a tremendously good effort. If you're a fan of the Souls series or have been awaiting a follow-up to Ninja Gaiden, this is a game worth checking out. It's polished, it's brutal and we absolutely love it. 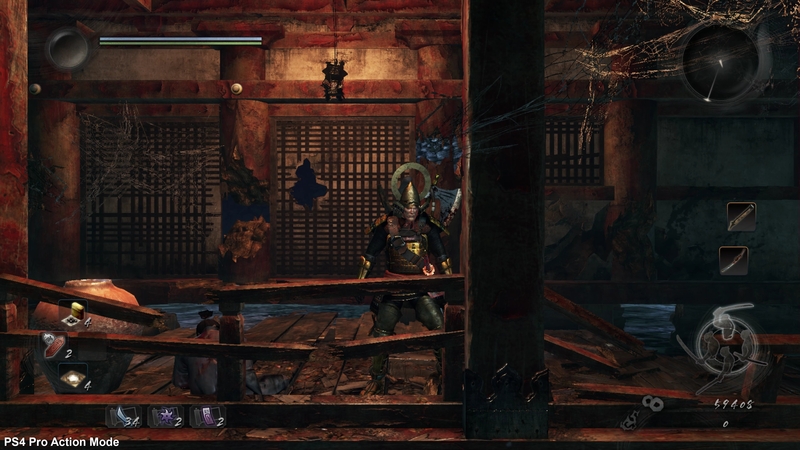 Nioh demonstrates the benefits of remaining conservative on the visual front in favour of high performance and refinement. So while it may not appear cutting-edge, we have high hopes that Nioh is a game that will stand the test of time, just like Ninja Gaiden before it. Adds new battle arena The Abyss. Loot gathering is now way more convenient. 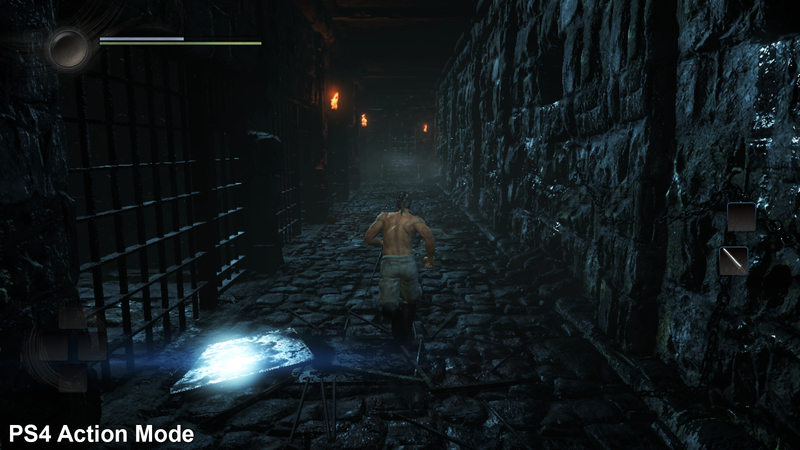 Adds new area, enemies and difficulty options. Dragon of the North arrives in early May.